"This soup was great, so creamy. I add some carrots and green beans to it and it has a little more fiber and a little more heartiness to it." Combine potatoes, carrots, green beans, celery, onion, ham, and water in a stockpot. Bring to a boil and cook over medium heat until potatoes are tender, 10 to 15 minutes. Stir in chicken bouillon and pepper. Melt butter in a separate saucepan over medium-low heat. Whisk in flour with a with fork and cook, stirring constantly, until thick, about 1 minute. Slowly stir in milk so lumps do not form until all of the milk has been added. Continue stirring until thick, 4 to 5 minutes. Pour the milk mixture into stockpot and cook soup until heated through, about 5 minutes. Serve immediately. 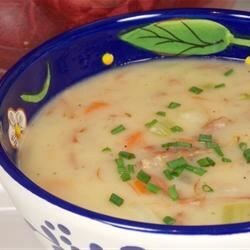 This recipe is a healthier version of Delicious Ham and Potato Soup. This soup was great for my picky family. Everyone had seconds. Good hearty soup for a winter evening. I used vegetable broth instead of water. I loved it!! Made no substitutions! !